Dubai in the United Arab Emirates can seem like a world away from everything, and that’s probably because it pretty much is. From my home in Orlando, it’s roughly a 15-hour direct flight, which is a lot too handle – especially for newbie travelers. However, Dubai is one of the most unique cities in the world that you’ll ever visit, and also one of the most wheelchair accessible. This is mostly due to the fact that nothing in Dubai was built more than two decades ago. The city site was mostly sand and dust prior to the 1990s, so everything is glittery and shiny and new – and largely designed with stroller-toting moms, older individuals, and wheelchair users in mind (with a few exceptions). Here are some tips for getting around Dubai and what to see. DXB will be your first glimpse into the modernity that is Dubai. I was meeting friends there whom I would stay with, but I flew there alone. They recommended (and now I recommend) that I book airport concierge services with Marhaba. They will meet you upon arrival, guide you through immigration, help you get your bags, and take you to the ground transportation area. On departure, they will help you check in, guide you through security, and give you access to their excellent lounge. Speaking of security, you need to be aware that this is no joke in Dubai. You will be fingerprinted, photographed, and a retina scan will be taken. There are 3,000 cameras in the Dubai airport alone, and thousands more all over the city. I will cover security more a little later, but please understand you will be watched at all times. 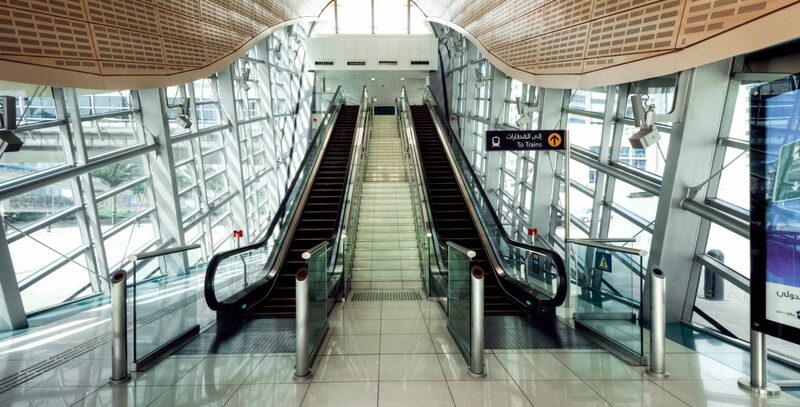 The easiest way to get around Dubai is using the very accessible and modern metro system. There are stations close to most major sights and tunnel connections to some, like the mall. You can buy different kinds of fare cards which will give you access to different class metro cars. I personally didn’t notice any significant difference between the classes (although Silver is more crowded than the more expensive Gold), and there are dedicated wheelchair spaces in both classes. The cars are level with the platform and the gap is one inch or less. There are metal grooves and dots in the ground for the blind and services for the hearing impaired as well. The one weird – and sometimes major – obstacle at some metro stations is the lack of curb drops. And the curbs in Dubai can be very high. I have no idea why the Emiratis would go through so much trouble and expense to make the metro itself so accessible, yet fail to install curb drops at some stations. This is a city-wide situation, so please be prepared with a portable travel ramp or someone who can help you. There are wheelchair taxis available through the Dubai Taxi Corporation. I used one to get to the airport, and it was a comfortable van with a rear-entry electric lift. They do need to be reserved at least 24 hours in advance. The Dubai city buses are modern and also wheelchair accessible. The foldout ramp is located in the center of the bus, and the driver will pull it out when he sees you at the stop. Not all stops have a wide curb with room for you to exit, so just ask the driver to drive up a few more yards to safely let you roll out. Because I was visiting friends and staying with them, I did not stay in a hotel. That being said, there are a large number of hotels with wheelchair accessible rooms with roll-in showers and other ADA-style accommodations. 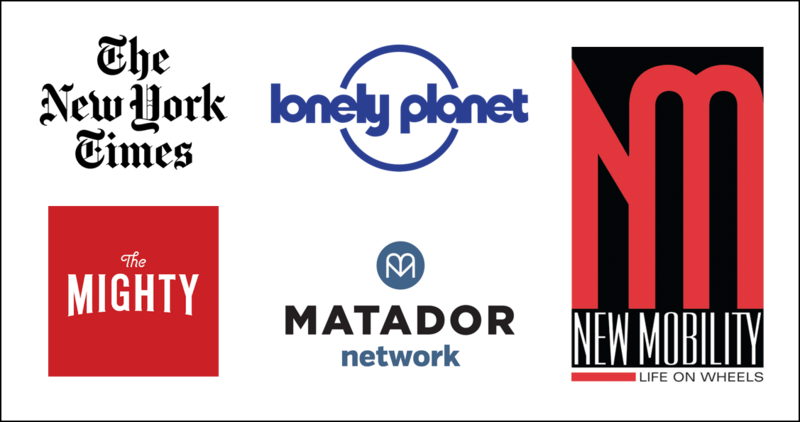 Staying in a western chain hotel is your best bet, like a Marriott, Hilton, or Holiday Inn. However, an accessible travel agent can help you find a hotel that best suits your needs. Burj Khalifa. 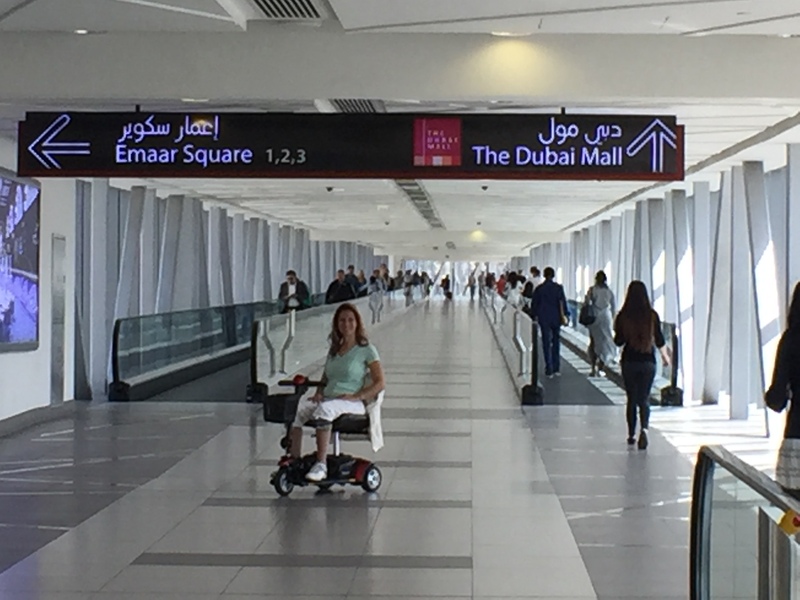 There is no shortage of exciting wheelchair accessible activities in and around Dubai! And many of them will be the largest in the world. 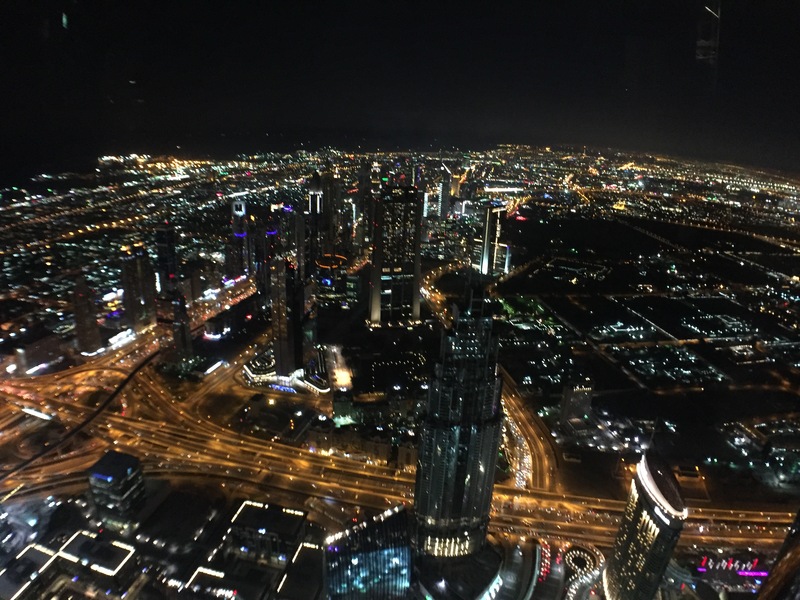 An absolute must-do is taking a high-speed elevator to the top of the Burj Khalifa, currently the tallest building in the world (and probably for not much longer). Fortunately I’m not afraid of heights, as the view from the open-air observation deck on the 124th floor can be dizzying. In addition to the stunning view (I would recommend going at night, as the daytime view is often brown and hazy with all the dust), you’ll get to see a cool museum and displays outlining the building’s history and construction. Shopping. If you love to shop, you’ll be in heaven in Dubai. But bring a fat wallet! The two main centers are the older Mall of the Emirates and the Dubai Mall, currently the world’s largest. The Mall of the Emirates is probably best known for its indoor (but rather small) ski “resort.” While it’s not accessible, it’s pretty cool to see people skiing down the artificial snow-covered slope while it’s over 100 degrees outside. 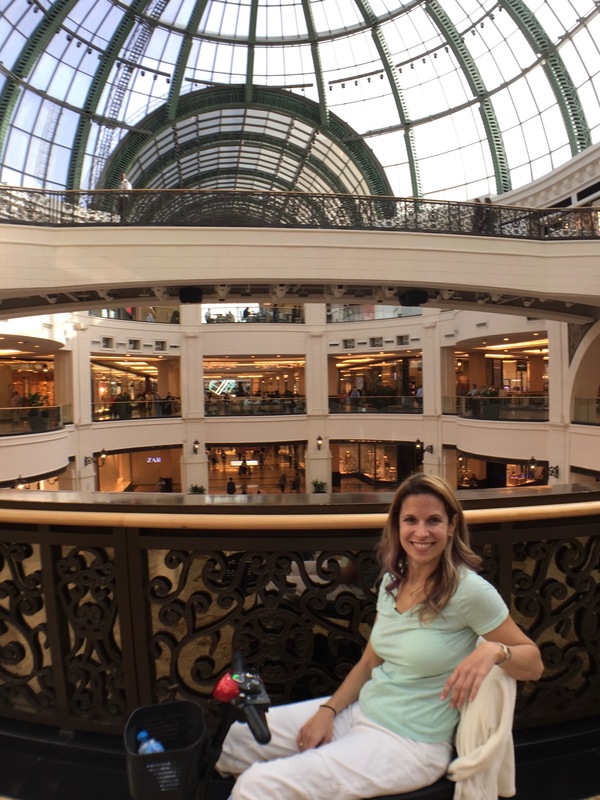 The Dubai Mall, in addition to its multiple store sections (from popular to appointment-only haute couture), also has a really cool aquarium with a shark tunnel and great restaurant options. Bring a sweater or jacket because the mall interior definitely overcompensates for the baking exterior. Souks. If massive indoor malls aren’t your thing, then you can check out one of the open-air souks for more locally-themed items. 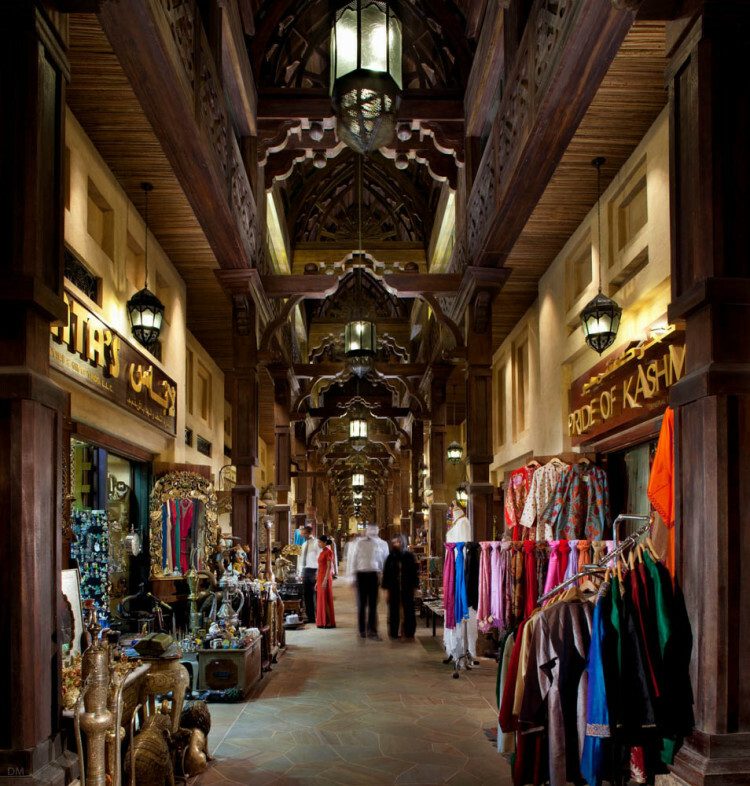 I visited the Souk Madinat Jumeirah, which is a large and very nice souk near the 7-star Burj al-Arab luxury hotel. You can find everything from finely embroidered tunics to expensive jewelry to glittery souvenirs for all your family members. There are also outstanding restaurants and bars in the Souk Madinat Jumeirah, as well as separate wheelchair accessible restrooms for visitors. Dining. If eating is your thing, you will not lack for choices. While it’s tough to find inherently “local” Emirati cuisine (if there is such a thing), Dubai is extremely international and offers dining options from all over the world. If your budget isn’t small (which should be the case if you’re visiting Dubai, I would highly recommend splurging on one of the many “traditional” Friday brunches offered at several resorts. 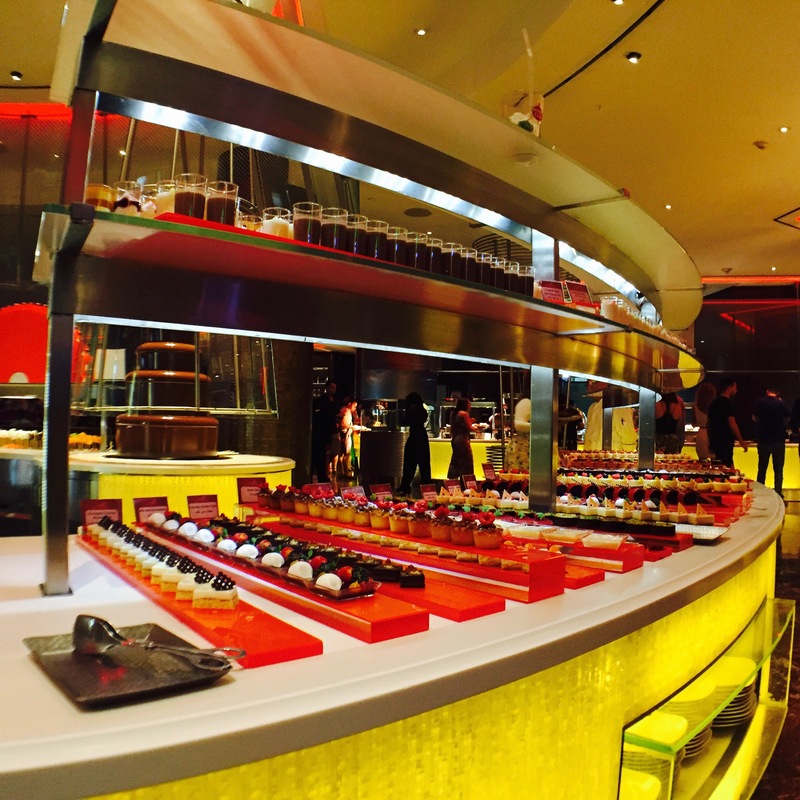 My friends and I went to the brunch at Saffron in the Atlantis Palm Jumeirah resort. It set each one of us back about US$120, but it’s not just an all you can eat buffet (of items including filet mignon and caviar); it’s all you can drink. If you can bring a spare liver with you, you’ll definitely use up what you’re paying for the experience because champagne and top-shelf liquor are included in the price. Fountain Show. Even if you haven’t been to Las Vegas, you may have heard of the musical fountains at the Bellagio Hotel. 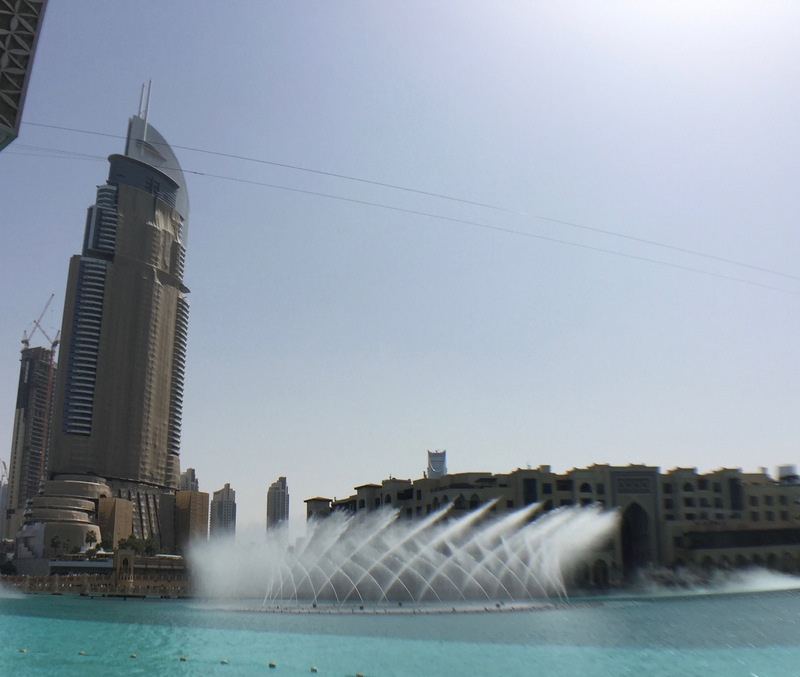 Well, some Emirati sheikh saw these fountains and told his people he wanted the same fountains in Dubai – except bigger and better. The fountains can shoot water up to 500 feet in the air, and they are precisely choreographed to different kinds of music (the show I saw was accompanied by the Nessun Dorma aria). You can now see this watery music and light extravaganza in a large plaza between the Burj Khalifa and the Dubai Mall. Shows take place at 1:00PM, 1:30PM, and every 30 minutes between 6:00PM and 10:00PM on weekdays. On Thursday, Friday and Saturday, the performances run until 11:00PM. Desert Safari. Just because you’re in a wheelchair doesn’t mean you can’t bash some sand dunes, ride a camel, hold a hunting falcon, or enjoy a whirling dervish and belly dancing show. 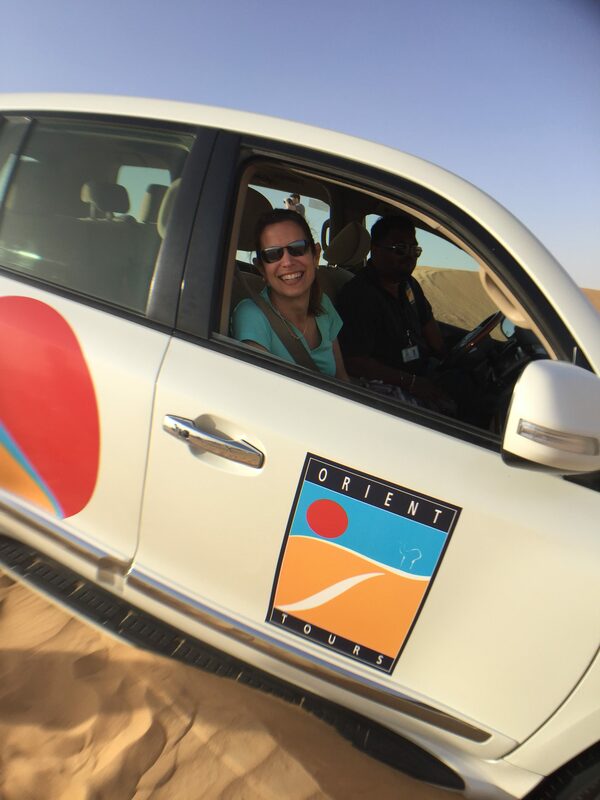 My friends made arrangements with Orient Tours to make their half-day 4×4 desert safari accessible for me. I got to ride over sand dunes at breakneck speed like I was on a roller coaster, which was amazing! The bedouin camp during the second part of the safari even has a paved path from one of the tents to a wheelchair accessible bathroom – in the middle of the desert! As a caveat, you will need to have full upper body control to manage the dune bashing. You will also need to use a manual wheelchair (I had rented one for my stay) or a travel scooter that will break down and fit in the back of the SUV. The extra arrangements are worthwhile, as this was my favorite part of my stay! Many people associate the Middle East with terrorism and violence, but Dubai is actually one of the safest cities in the world. This is mainly due to two things: the thousands of security cameras located all over the city and their extremely strict laws. There is a zero-tolerance policy for public intoxication (punishable by weeks in jail) and drunk driving (a life sentence). Drug possession can lead to capital punishment, and improper contact between unmarried men and women can also mean jail time. This doesn’t mean you can’t drink or buy alcohol or kiss someone; you just have to do it in the privacy of your hotel. If you’re going to drink, do it wherever you’re staying or plan to take a taxi from that point directly to your hotel. Being drunk on a bus, on the metro, or even rolling on the sidewalk is not an option. Dubai is very modern and international, so foreign women are not expected to cover their heads. However, it is still a Muslim country, and women are expected to cover their shoulders and longer pants (NO shorts). 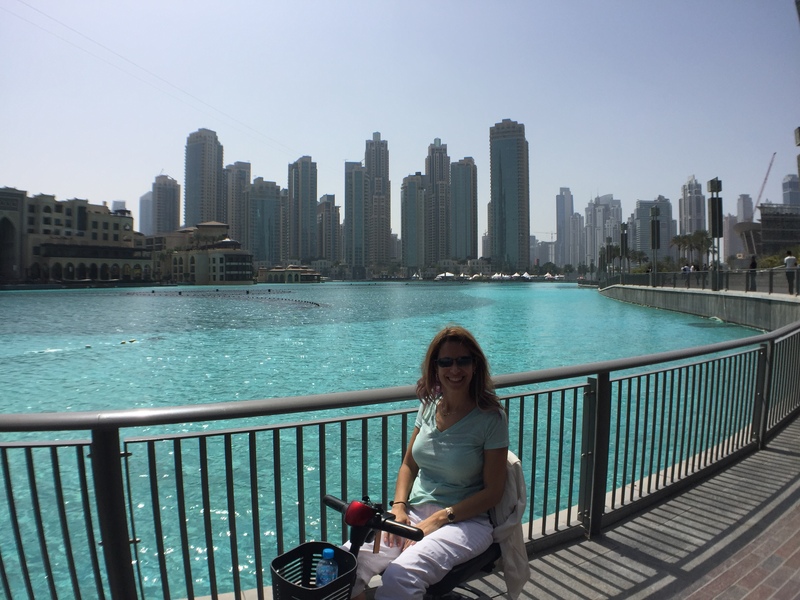 Yes, it gets very hot in Dubai, so I would recommend light colored clothing and lightweight fabrics, like cotton or linen tops and capri pants or slacks. I always had a light scarf with me just in case. The local Emiratis seemed oblivious to me and my scooter/wheelchair, but they only make up 11 percent of the population. Most residents are hospitality and construction workers from different parts of Asia. They WILL stare, especially if you’re a woman, so be prepared for this cultural difference. However, local men will not touch you, approach you, or harass you – especially not in public. Are you ready to check out sparkling Dubai? 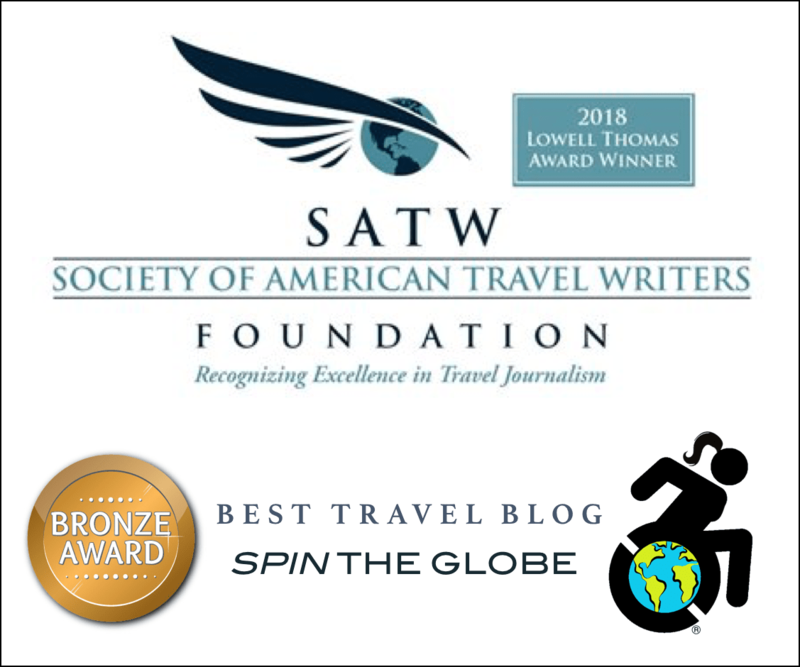 Contact me through my accessible travel agency at Spin the Globe / Travel and I’ll help you get there!